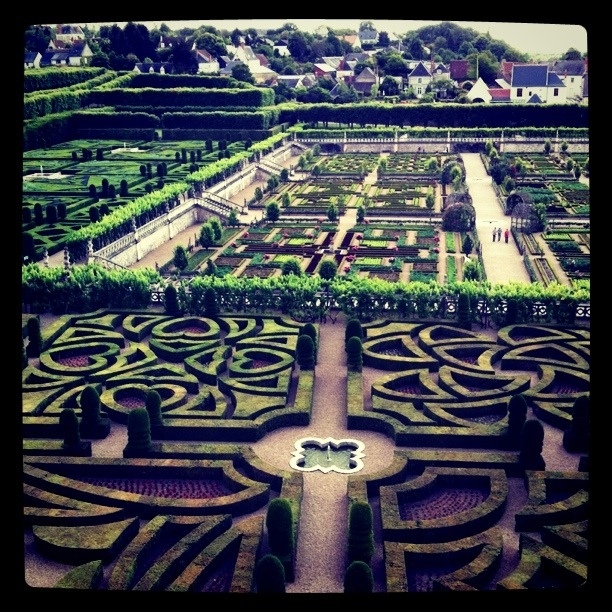 iPhone/Instagram photo of the Villandry Gardens Not sure how many of you out there have an iPhone, but despite the expense of them (even more here than in the US), they are well worth every penny. They are especially helpful when you’re traveling (and learning French) since there are unlimited apps to help you with new words and also help you find your way home on a daily basis. Not that I would know about that………………….. The only major downside to my iPhone is that there is some sort of voice activation feature that I don’t understand and periodically, when the big button is pressed (which sticks out because of the iPhone cover that I have), music from my iPod will start to play. It seems like the music that starts to play is often related to the noise in the background (I guess that’s why it’s called “voice activation”). This can also happen when my phone is in my bag and I put it down or it gets bumped against something hard. Like today. In the middle of French class. With a group of women I don’t know very well. I told the Witch Doctor I was in love with you…..
Did I mention that I put a locking code on my iPhone just in case it gets lost or stolen? Do you know how long it takes to remember your code and punch it in to unlock your phone while listening to the Witch Doctor in front of a class of people learning French? Answer: A really long time. This entry was posted in language and tagged cultural faux pas, witch doctor. Bookmark the permalink. these posts crack me up! loving reading about your french adventures. ps: it is FINALLY warm enough back here to wear my jakfish outfit!! !